Land O’Lakes SUSTAIN® platform – a powerful tool that can make a real impact in improving regional water quality — is coming to the Chesapeake Bay. 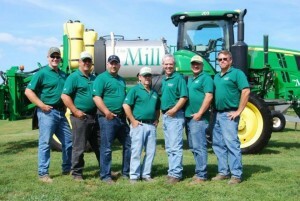 The Mill®, a large agricultural retail company, today became the first business in the area to utilize SUSTAIN in Maryland and Pennsylvania. SUSTAIN provides ag retailers with tools and training in best practices for fertilizer efficiency and soil health – such as cover crops and precision ag technologies – while maintaining the potential for high yields. Retail staff then bring this knowledge to the farmers they serve, meaning that one retail location can reach hundreds of farmers. That’s why the platform, co-developed by Environmental Defense Fund, is taking off. Thus far, 27 ag retailers across the country have been trained, and food companies such as Smithfield Foods, Campbell’s Soup, Unilever, and Kellogg are connecting to the SUSTAIN platform as a way to meet their corporate sustainability goals.